The days of gray are a part of Zürich. It is something I have been warned about since long before I moved here, and I did brush off the warnings as overexaggerations. The funny thing I have also been told is that it really has not been so bad here since I have arrived. I haven't seen anything yet, I am now routinely reminded. Needless to say, I have moments where I am deeply affected by the steely skies. Coupled with the natural nostalgia of Autumn as well as some of my own challenging memories from this time of year, the lack of sun can subtly dust over me a sense of sweet melancholy. There was a time in life when I used to think there was something wrong with this feeling, something to be done. But now I have grown to deeply appreciate the sense of solitude and sadness that accompanies falling leaves and crisp air. One of the things I most love about Chögyam Trungpa's writings is his description of the self uncluttered by layers of identity, as The Genuine Heart of Sadness. I find this notion hard to even describe to English speakers, let alone to translate into German. One can think of it as the most tender and vulnerable part of our self, which is uncovered when we encounter great beauty and also unthinkable loss. It is the part of us which sheds a tear while listening to a symphony or that closes her eyes and smiles when encountering a scent that takes her back to grade school playgrounds. It is the aspect of the hardened old man who lights up at the smile of a child. It is the pang in my heart when I see fields of sunflowers and think of my best friend who loved them, gone now for a little over two years. The Genuine Heart of Sadness does not imply that if we make contact with this aspect of ourselves, that we then walk around sad all the time. Instead, it is the notion that we allow life to deeply touch us and when it does so we feel the intensity but also the fact that we are, on one level, completely alone on this journey. No one else can get inside our heads and hearts with us. At that basic level, we are incredibly tender. We are completely vulnerable. And while we are not depressed at the notions of life and death, there is a deeply moving quality to reality. 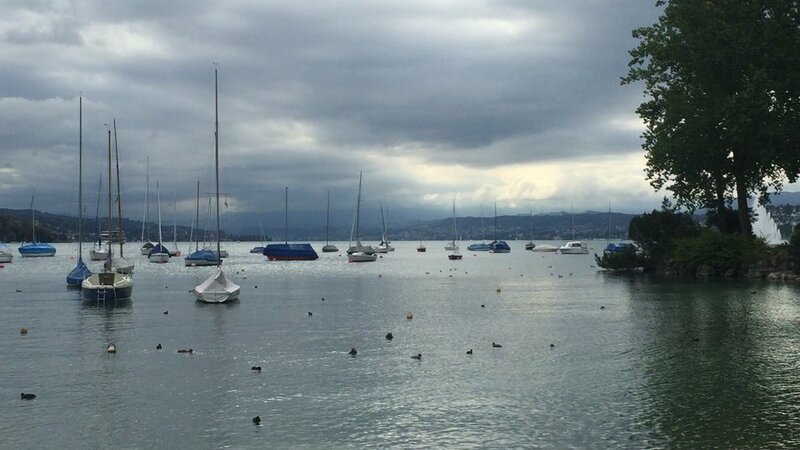 The gray has been coming and going here in Zurich. I appreciate its fleeting nature for now but also know that it could choose to stay for a long while one of these days. If it does, I know it won't be easy for any of us. What a difference the sun can make, eh? What I also know is that I will try my best to really feel the gray, to stay in it rather than wish it away. I will allow the gray to play up the bright colors of my home when I enter, or the smile of my daughter which is more blinding than sunshine in its intensity and warmth. I can take comfort in the gray mists and fogs here, which feel mystical and a bit otherworldly. I can feel my nostrils touched by the cool dampness of the air as it hangs, brisk and bright like platinum. Like all things, the gray will eventually go again. But while it stays, I can stay with it. And feel my tender heart. And witness my melancholy. And be absolutely ok. More than ok. I can be human.